In 2015, there were two major movies traditional country fans had to look forward to. One was a full-featured, big budget, major Hollywood-funded Sony-distributed film on the life of Hank Williams starring a fast-rising movie superstar in Tom Hiddleston in which no expense was spared, Hank’s estate was fully on board and his entire music library had been licensed to use, and was preceded by Oscar buzz even before the first screenings. The other was a made-for-TV, G-rated “faith-based” movie, leaning primarily on unknowns and career television actors for the cast that would attempt to take the premise of a single Dolly Parton song and string it out for two hours in the restrictive environment of network television—basically, the Hallmark Channel goes country. And guess what movie ended up setting records, wowing critics, wooing fans, and guess which one received such woeful early reception it got pushed all the way back to 2016? Coat of Many Colors, which aired originally on Thursday, December 10th and will be rebroadcast on NBC Christmas Night, was not some sort of astounding feat of movie magic. What was astounding is how good it was as a television movie, and aside from some isolated moments, avoided much of the schmaltzy, cheeseball, cornpone feel that can completely ruin what otherwise might be a strong premise, yet tries to make a movie that will appeal to everyone in the rigid reality of mainstream TV. Instead Coat of Many Colors was strikingly honest and candid in segments, was smeared with dirt and grease to the point where not only were the characters and settings believable and historically accurate, but you could almost smell the sweat and feel the grit in gripping scenes. The film was bold in how it dealt with very private and personal family issues, at points challenging the definition of a “G” rating in how graphic both the language and depictions played out, and chose to highlight more dark moments than light ones to render what ultimately was a positive story, but one fraught with tragedy, personal shortcomings, and public doubt of faith before eventually finding redemption. Unlike many faith-based movies, Coat of Many Colors was bravely willing to broach the subjects that lead to doubt, and didn’t avoid the complexities of religious understanding, it purposely lead the story head on into them. 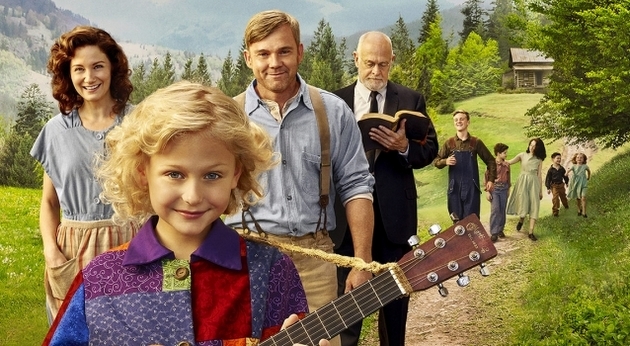 All of this is surprisingly well acted by long-time television star Ricky Schroder as Dolly Parton’s father, country singer Jennifer Nettles as Dolly’s mother, and the show stealer, Alyvia Alyn Lind who portrayed a 9-year-old Dolly Parton. The sets and settings felt painstakingly authentic, the accents were thick without feeling phony, and the dialogue, though at times a little corny, included unexpected kernels of wisdom that made the other more predicable moments more forgivable. Sometimes the emotional vibe of scenes shifted gears too quickly, leaving the viewer unsure of where things were being left between main characters, but the main concerns for the movie were mostly due to the limitations of the television environment. Commercial interruptions were especially difficult to power through for a film that relied on transporting you back to the Great Smoky Mountain in 1955 and keeping you there. A bit more character and plot development, if not more isolated moments for musical performances could have enhanced the emotional quotient in and already potent film. And the ending felt a little forced, though it brings together the full circle that makes Coat of Many Colors a complete package, even if it takes a few cheesy curves to get there. Even Jennifer Nettles mastered the moments where she needed to express her emotions in subtle hints as opposed to her usually overly-expressive personality. Dolly Parton has never been willing to sign her name to something that she doesn’t feel will ultimately be successful, from the beginnings of her musical career, to exploring the crossover market, to becoming an actress, to owning one of the most successful theme parks in middle America. You had a good idea Coat of Many Colors wouldn’t be a washout, but who knew the impact of the film would be so lasting. One misstep might have been not overtly building in a Christmas element into the “inspired by actual events” plot to make annual viewing a tradition itself. Dolly and the producers have set a high bar for subsequent episodes in what has already been promised as a three-part series of movies. Whether you’re a traditional country fan, a fan of entertainment the entire family can watch together, or simply an admirer of Dolly Parton, you can’t help but to feel defeated many times when you turn on your radio or television to see where once proud institutions have descended into filth due to a hedonistic pursuit of money and ratings. But here was an effort that stuck close to its values, yet measured in enough compelling material that it still appealed to everyone, and proved that quality programming is not dead, it just needs to be given a chance. And once that chance is granted, more times than not, it thrives. And TV is not just better for it, we all are. It’s not just about asserting a set of values through a story, it’s about telling stories of value, which Coat of Many Colors certainly was. Coat of Many Colors will re-air on NBC Christmas Night (check local listings), or can be streamed in its entirety below. Great movie based on an even better person. I truly loved the movie. Watched it 3 times. Would really love to see more movies about her true life story. Dolly Parton is such a great ambassador for country music, and in so many different ways. This movie was so fabulous! I LOVED it! Loved the movie!!!! !Great true portrayal of the life challenges of mankind. Spiritual focus was dynamic;an experience America needs to retrieve!!! I loved the movie and would love to see it again. I missed the beginning. This movie was fantastic. I loved every thing about it. I came in late for the replay, must admit what I did see was enjoyable. Thought Jennifer Nettles did a nice job, really the whole cast did. I can see this going in holiday rotation, without any Christmas overtones. Curious to what Lil Dale thought about it! This is the best most touching movie I have seen in MANY years. Dolly is a wonderful person and the portrayal of the gospel divine. I hope she makes many more about her life. She is such a loving talented Christian… We need more of her in this world. Trigger, I heard about the tornadoes sweeping through Texas, especially in the Dallas area. Hope you and your loved ones are okay. Just watched this, this afternoon, great movie!!!!! Very well done, faith based movie. Much like “Coal Miner’s Daughter” it shows a better time, a world that no longer exists, sadly.